i have tons & tons of pictures to go through & share with you from our trip to springfield, illinois. we met lots of wonderful people...family & friends...and everyone, of course, got to meet lil' miss ella. i'm unpacking, doing laundry and getting back into the "routine" today...but i'll give you just a taste of some of the beautiful country we were surrounded by...this is one of my fave pictures. (taken just down the street from grandma & grandpa schnapp's house). 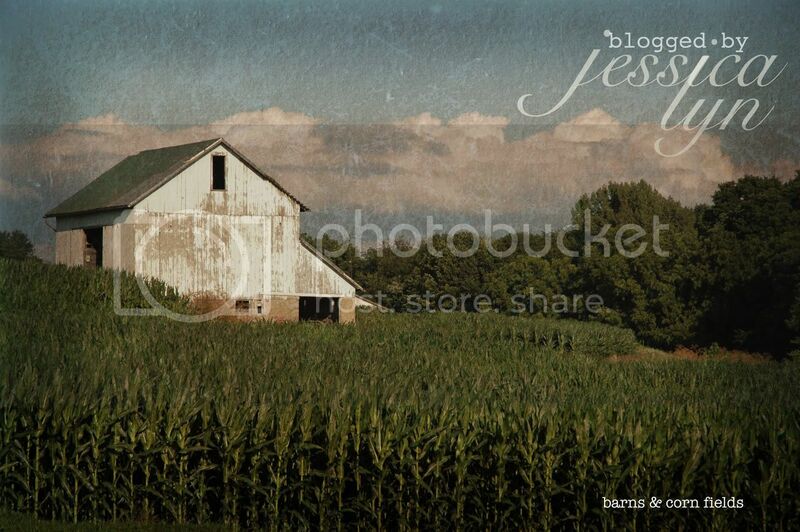 mmmmm....i love old barns, old houses, cornfields, wide open spaces! it was "picture-taking- heaven" for me. so beautiful. and the weather was absolutely SPECK-tacular for us the entire time. highs in the 70's & it even got down to 52 one evening. (what?!) slept with the windows open. (until the coyotes and neighbor dogs decided to serenade us). the trip couldn't have been more perfect. can't wait to fill you in on all of the details. (food, family, food, friends, food, scenery & did i mention food?). thank you grandma & grandpa schnapp for such a wonderful visit - we thoroughly enjoyed ourselves. overlay on picture from nicole v and the vignette is from coffee shop actions.